Brianne Morrison was happy being a stay-at-home-mom; she didn't need a job, nor did she want one. She especially never liked the idea of multilevel marketing (MLM) companies or direct sales (DS) "because I am not pushy," she says. "If I ever needed to get a job for any reason, I never thought it would be in one of those areas." That is why Morrison passed on the first opportunity she was given in 2007 to work as a consultant for Entertaining At Home (EAH). "I had just had my daughter and the timing was not good." Family was her priority. 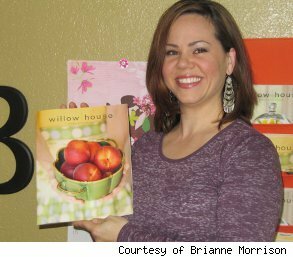 Three years later, when EAH merged with Southern Living At Home to form Willow House (WH), Brianne's feelings about DS changed. "The main pull for me was to have adult time and be able to have fun with the hobby aspect of the work." She also liked that Willow House was more focused on the design aspect of home decorating and styling, plus she really liked the products. "The idea of helping other women find things to make their home more beautiful was really appealing to me. I thought getting paid for it as well was even better." A starter kit was only $199 and included $550 worth of products such as order forms, invitations, business materials, catalogues, samples and more. "I thought if it didn't work out, at least I get to keep all of these products," Brianne says. Morrison works about 10-15 hours per week, booking five to six shows per month in her home state of Washington. Those part-time hours include doing the shows at people's homes, entering orders, and working the business, like visiting local medical offices and office parks to drop off WH catalogs. The main focus for WH consultants is in home parties, where 10 or more guests (mostly women) are shown the products and recruited as possible consultants. On average, Brianne sells about $650 worth of products per home show, and WH consultants take home 25 percent of all their sales. As an added bonus, if you sell $1,500 worth of products in one month, you get a $50 fuel bonus. The system is very streamlined at WH and easy for consultants to use. "I take all the checks and credit card payments I am given and I deposit them into my business account," she says, "so I get my commission checks almost instantaneously because they are directly deposited." "I was only working my business very part time because I have two young kids, so that first year I made about $3,000 in profits." Morrison's goal the first year was to host four to six parties per month -- which she did -- and still be able to go out two or three nights per week and be gone for a few hours and then be home in time to tuck her kids in bed. So, for her WH was a great fit. "People think there are quotas to fulfill and that scares them off. [This business] can be whatever you want it to be." Trust Brianne, she knows. "In October we had a death in the family and I didn't do any work; but when I came back to it in November it was still there." The two biggest pros, in Morrison's opinion, are the products and the support she receives from Willow House. "I really do love our products and they are great quality." She admits that it is possible to find cheaper decorations elsewhere -- but you may walk into your friend's house and see the same rug or mirror that you just bought at Target or Pier One Imports. She also says that she has found the training and support provided by Willow House to be exceptional. In addition to online training, WH is coming out with design courses next year so that consultants like Brianne can become certified interior designers. "They don't just expect us to sell their stuff." On the downside, Morrison says that the business and profits can be hit or miss depending on the time of year and your location. "If a woman was thinking of becoming a consultant, I would be honest and tell her that not every month is going to be a ball of fire." If you are thinking of looking into being a consultant with Willow House or another DS company, Morrison reminds you to speak with your family and spouse first, because that support is really crucial and something that people often underestimate. "Its not going to be consistent money, so don't expect that. It will have its ups and downs -- and that's OK. Focus on the personal growth that you will have and how you will get to meet new people and make new friends." While Morrison's kids are still young and only in school half days, she still wants to spend her free time with them, not working; but she is committed to staying onboard with WH. "I want to be part of their new products and the new phases they are launching. In the near future, I hope to take my business from part time to full time."